Hi - Ben Johns, Education Director, here. Chanticleer's education program is practically year round - so far this year - half way - we've seen 5000 students in our various programs here at home and around the country. While the ensemble was in Europe, I did 9 clinics in schools around the Bay Area. For the next couple of months our education program will be in more than full swing, encompassing ACDA appearances in Cincinnati and Tuscon, clinics, and rehearsals of our Lab Choir in the Bay Area. The really big event is the National Youth Choral Festival in March - over 400 high schools singers from 12 choirs from all over the country. Today at Lick Wilmerding High School, we tried something new. 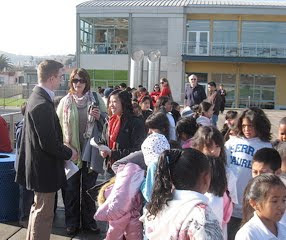 This is me welcoming elementary school students and their teachers, and some parents for a concert/demonstration.